Following their attendance at the Directors Guild of America awards, Marina de Tavira and Yalitza Aparicio attended The Hollywood Reporter Oscar Nominees dinner last night(February 4th) at CUT Beverly Wilshire in Beverly Hills, CA. 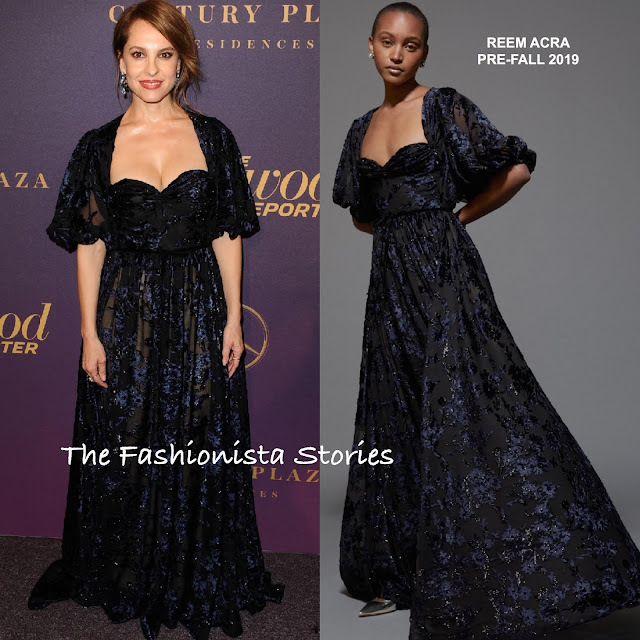 Marina de Tavira wore a REEM ACRA PRE-FALL 2019 sheer black and blue velvet gown with a sweetheart neckline and billowed, three-quarter sleeves. I like the fullness of the skirt on the model but Marina sells the gown either way. She dressed up her gown with BRUMANI jewelry which topped off her look, along with an up-do. Yalitza Aparicio posed in the ROLAND MOURET RESORT 2019 'Revere' green and black panel gown, with a cascading ruffle panel. The gown looks a little too tight on her but I like it for her in general. GABY VILCHITZ jewelry, red lips, straight off-the-shoulders, and NEIL J RODGERS pumps rounded out her look.